Born in 1985, David J. Ranftl has been interested in antique fans since 1998. Ever since, he has specialised in their research, study, and conservation, assembling a significant collection of mainly eighteenth and nineteenth fans. Having obtained his school diploma in 2005, he gained extensive experience working in local museums and archives. In 2006 he embarked on a Master’s degree in Art History in Munich, minoring in Bavarian and Byzantine Art History, European Ethnology, and Italian Philology. While studying he worked for a leading Munich auction house, published a number of articles, and undertook research for private collectors. His Master’s dissertation (2013) considered the fans of Munich’s royal court between 1850 and 1914, and was accompanied by an exhibition at the German Fan Museum in Bielefeld. 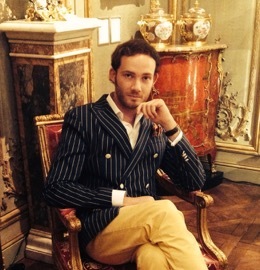 Since 2014 David J. Ranftl has worked for the internationally renowned art dealers Röbbig of Munich, specializing in eighteenth century furniture and objets d’art. He is the current curator of the German Fan Museum in Bielefeld, and a member of the Association of German Art Historians (Verband Deutscher Kunsthistoriker), the Fan Circle International (FCI), and the Fan Association of North America (FANA).